I had to travel to Cologne for work and I decided to make the most out of it and make a weekend out of it. I decided to travel by train as a solo female traveller and I found everything to be safe. It was a short weekend get-a-way and I travelled solo. Are you traveling to Cologne in the near future? 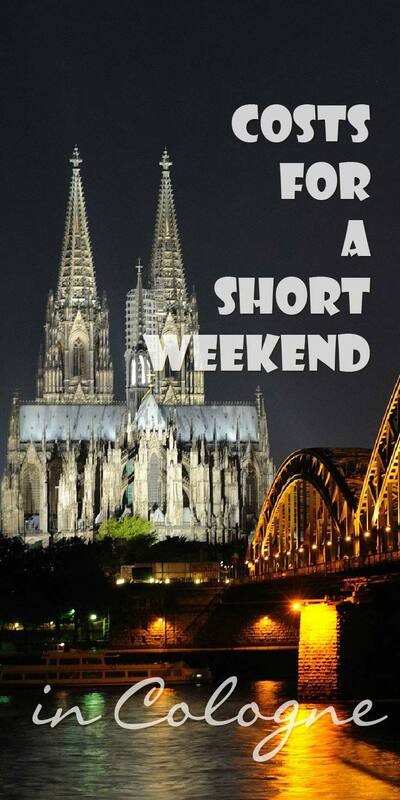 Do you wonder how to set your budget and what will be your costs for a short weekend in Cologne? My main tip for staying on budget while traveling is to actually set a budget and stick to it. You can only know your expenses when you keep track of them. Therefore, I give you my report on the costs for a short weekend in Cologne for 1 person. What were my costs for a weekend in Cologne? Costs to get to Cologne? 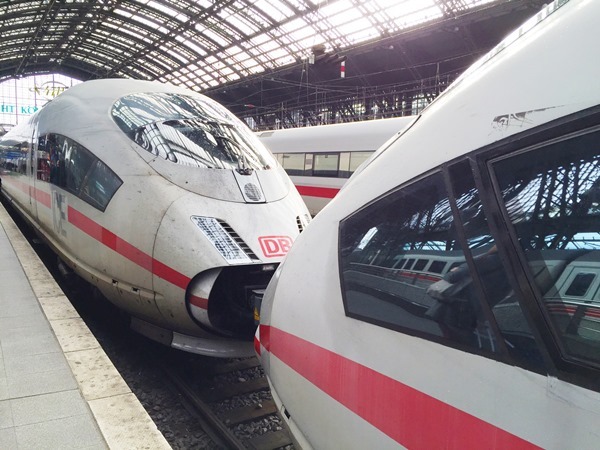 I wanted to see what it was like on the Cologne Main Train Station and it was easier for me to travel by train. Besides, I love travelling by train, so I booked 2 single tickets from my home town in the Netherlands to Cologne Train Station. The journey took me 2 hours and 40 minutes and I switched trains once per journey. I found a hostel in Cologne, the Cologne Downtown Hostel and you can read my review of the place here. I paid €25 euro for a 4 person, ensuite mixed dorm style room. This was for 1 night. 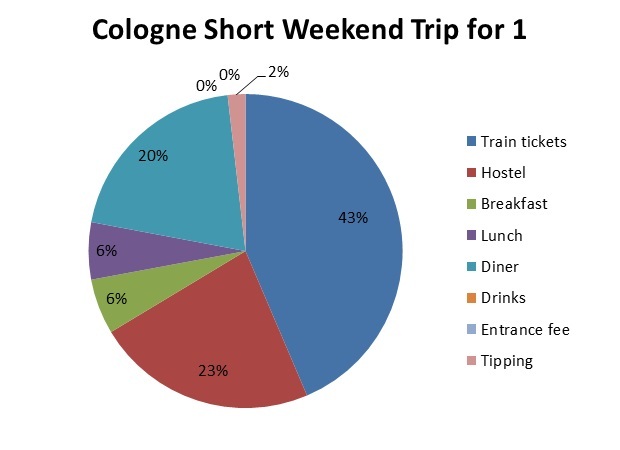 Here is a breakdown of the costs for a short weekend in Cologne. I only had lunch and diner on Sunday and breakfast on Monday. The hostel I stayed at had a supermarket at the ground floor. I bought some cut meat, cheese and some breads and a bottle of juice for my breakfast on Monday morning. I must say, it was more than enough to feed 2 persons. So I left the remainders in the fridge at the hostel and hope somebody else had a good lunch or breakfast with it. I didn’t exactly had lunch. I was hungry. It was around tea time and I stumbled upon a great coffee and cake house. 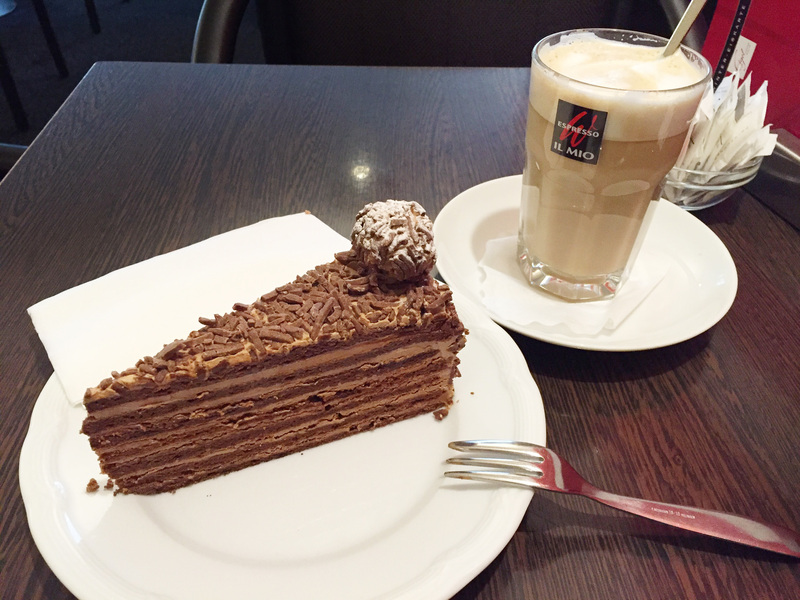 I spend 10 minutes looking at all the cakes and finally decided on a chocolate layer cake with a latte macchiato. I didn’t even check how expense the cake was. As it turned out: not expensive at all. It was the week before Carnival and I strolled around town. I found a nice and warm restaurant which was full with people dressed up for Carnival. I spend a few hours there and took my time. I ate too much and had a couple of beers. Oepsie. 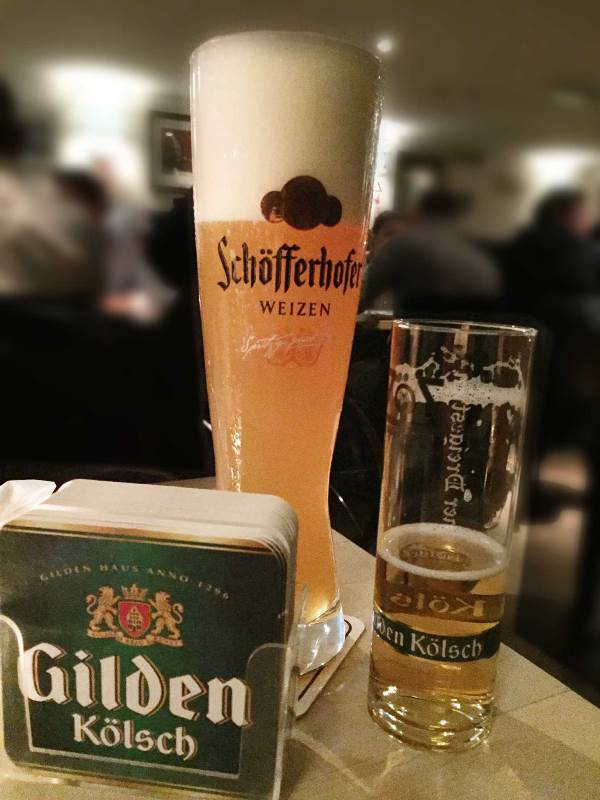 The small beer was cheaper than the tea, but ok. For more beer, try beer tasting in Cologne. Visit the Cologne Dom. I spent some time walking around the Dom and sat at one of the benches for a while to soak up the atmosphere. I walked around the old Town and checked the old houses and city gates. I visited one of the Romanesque Churches, the Big St. Martin Church. Museums: there are several interesting museums in Cologne, but I felt my time was too short to visit them. The Roman-German Museum looked really interesting and at only €9, you won’t go broke. Climbing the Dome: I really wanted to do this. It was only €4,00 but I wasn’t allowed to take my backpack with me. 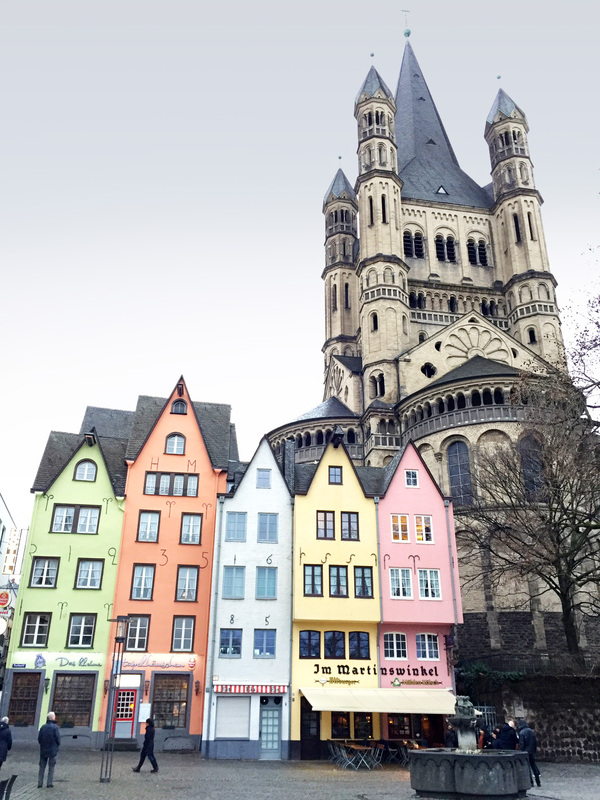 More things to do on a day trip of Cologne by Go Beyond Bounds. That’s a whole lot of calories burned and guess what: all for free. I only tipped in the restaurant for €2,00. I didn’t buy any souvenirs or postcards. I could drink the water from the tap and kept all the rest of my money in my pockets. I recently did a costs report on the costs for a 5-day trip for 2 to Dublin. When I compare that to my weekend in Cologne, I notice that the transport costs to get to the destination are the same. For Cologne a train ticket for 1 person, for Dublin 2 plane tickets. I know our tickets to Dublin were dead cheap, but 43% of all expenses, the train tickets to Cologne seem rather expensive. As I only had 2 days, I didn’t explore that much and did free things. Entree for the main Cologne Dome was free. I did spent some money on food, but I think I kept things rather decent. What do you think? Did I spent too much? Do you keep track of your expenses? Please share your experiences in the comment section below. Ghe ghe thank you Tonya. I am a mess. Not organised at all but when it comes to finances I’ve learned the only way to really know what’s going out is by keeping track. I am always up for a guestpost. Thanks. great trip it seems, I also keep track of my expenses. The church looks great. It sure was Sadhvi. Thank you.